Charlotte Brown and David Brown take part in a past show at the New Canaan Inn. Mrs. Killebrew was in her 90s, wheelchair-bound and living at the New Canaan Inn when she got the moniker “Killer Killebrew” so dubbed by New Canaan High School’s Service League of Boys. “The first year the SLOBS came to the Inn, they decided they would play poker,” explained Barbara Jeffries, the Inn’s director of activities and programs. Days were when nursing and assisted living homes’ activities consisted mainly of bingo, hooking rugs and attending ice cream socials. At the Inn, something enlivening and stimulating happens every day: lectures, book discussions, exercise and memory classes. 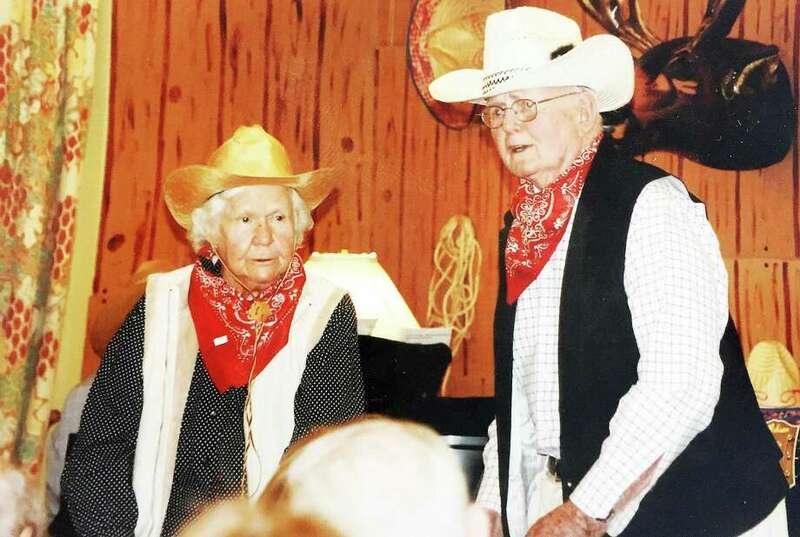 Thanks to Jeffries’ inventiveness and creativity, she and the inn have offered something even more unusual annually for the past decade: an original musical revue. Rolling out the carpet for a “come one, come all” welcome, it attracts townspeople as well as residents. “We always have packed houses, even standing room, and we’re televised locally.” said Jeffries in a person-to-person interview. This year, it’s “An Old-Fashioned Vaudeville Show.” Promised are singers, tap dancers, a magician, a comedian who’ll tell chicken jokes (accompanied by a live chicken), a barbershop quartet, stilt walkers, dogs, even a gorilla. “An Old-Fashioned Vaudeville Show” will be performed at The Inn, 73 Oenoke Ridge, New Canaan, Tuesday, April 24 at 7:30 p.m. Admission is free. This year’s barbershop quartet was last year’s doo-wop singers whom Jeffries encouraged to, er, change their tune. Accompanied by Justine Macurdy on the piano, the quartet — Mike Allorca, Bob Caird, Fred Haines and Lou Scalfani — will don bowties to belt out favorites. In addition, a local plumber, Gary Sirico, is the magician, Ken Oxman the comedian and local students the tap dancers. June Bird and inn resident Don Harbour are surprise novelty acts and a Great Dane will wear a tutu. Jeffries, born in Wilmington, Del., was brought up in Fairfield. Married to the late Robert Jeffries in Greenfield Hills’ Congregational Church at the height of a dogwood season, she has three sons: Chris, a composer, lives in Seattle; Andrew lives in Manila, where he works for the Asian Development Bank; Jeff, a sales representative for Marvin Windows, lives in Connecticut. Middlebury College. Entering the work force, she was administrative manager in New Canaan High School’s guidance office, then worked for a consulting firm before answering an ad for the New Canaan Inn, an independent living residence under the umbrella of the Waveny Life Care Center. To keep the residents active — intellectually, emotionally, spiritually and physically — Jeffries invites professors to give lectures, plus luminaries like the first selectman and the director of the Chamber of Commerce to talk about the town. Local retired men discuss current events to keep residents as engaged in the community as possible. Jeffries, who laughs easily and lustily and whose enthusiasm is contagious, does everything on a shoestring budget. “I’ve been collecting material for 25 years,” she said. “I go to Goodwill, the Party Shop, Happy Daze, the Christmas Tree Shop. I have a closet full of costumes and hats.” For the shows, she also makes signs and props, sends out invitations, writes the scripts, narrates the revues and conducts the choir.